And here are the other 8D dimensions in an overview of our free Business Training. 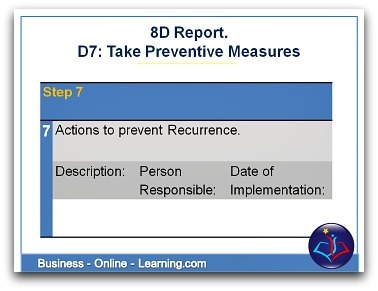 In this section of the 8d Process, D7: Taking Preventive Measures, the aim is to prevent the original problem ever occurring again, that or any similar problem. checking the trigger of the problem or what triggered the whole situation. Has that been dealt with? Would it possibly trigger off some sort of similar problem? Now that all possible reccurrance has been avoided, the next step is to update the system or systematic approach that takes place around where the root cause was. This means, for example, updating procedures, retraining employees, putting new measuring equipment in place, changing checking procedures, etc. Thirdly, obviously not a "Must" but a well recommended step to take to get maximum value out of all work done here in the 8D steps; document the lessons that were learnt along the way. At some stage, hopefully later rather than sooner, the knowledge gained in doing the 8D will be extremely valuable in some other situation. Particularly in view of the trends towards frequent job changes of employees, this would be one way to retain the knowledge within the organisation. Also, they believe that Knowledge Management could be part of the new update of the ISO9001 standard and the lessons learned here would be a fine example of knowledge capturing within your company. Are the reasons for the problem occurring now fully clarified? Are the influencing factors fully clear? Have all changes to the system or the organisation been carried out? Has this implemented measure been included in the appropriate documentation: Process documentation, test specifications, etc. – And are the employees informed? This is the Seventh section of our form. This template for all 8d Problem Solving Process is downloadable from our Resources page. In the following pages, we will be going through each section and each dimension of the 8d Report. 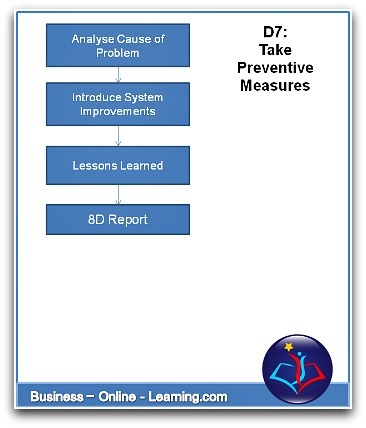 This section of the 8d report is to document the exact details of all Preventive Measures. As with all other sections, the documentation of these details will potentially have legal implications, so it is important to keep that in mind.